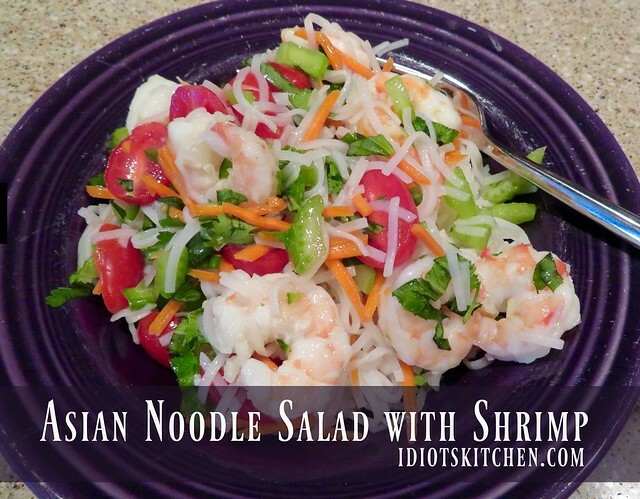 Asian Noodle Salad with Shrimp – Perfect for hot summer weather! This is an incredibly versatile salad. 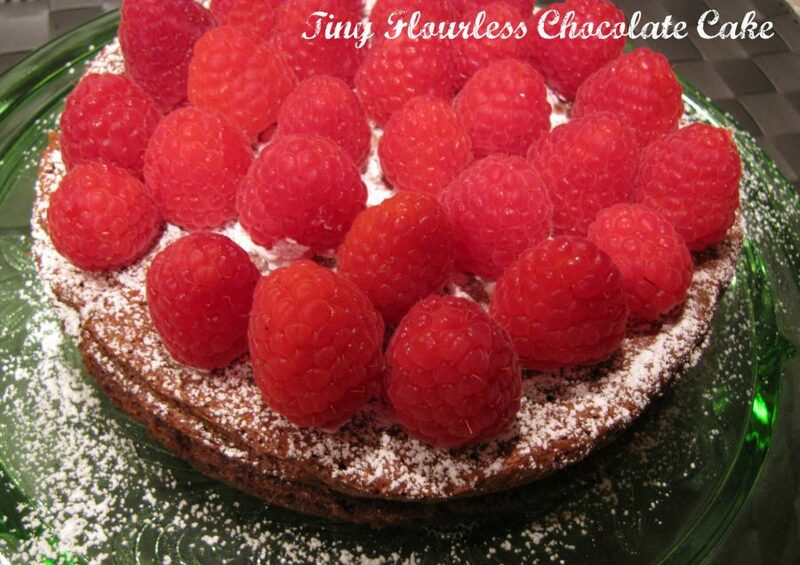 It can be made ahead and refrigerated or made when you’re ready to eat and served at room temperature. Add whatever veggies you like, have on hand, or have growing in the garden! Because it’s made with rice noodles or glass noodles (bean thread noodles), it cooks up in only minutes. 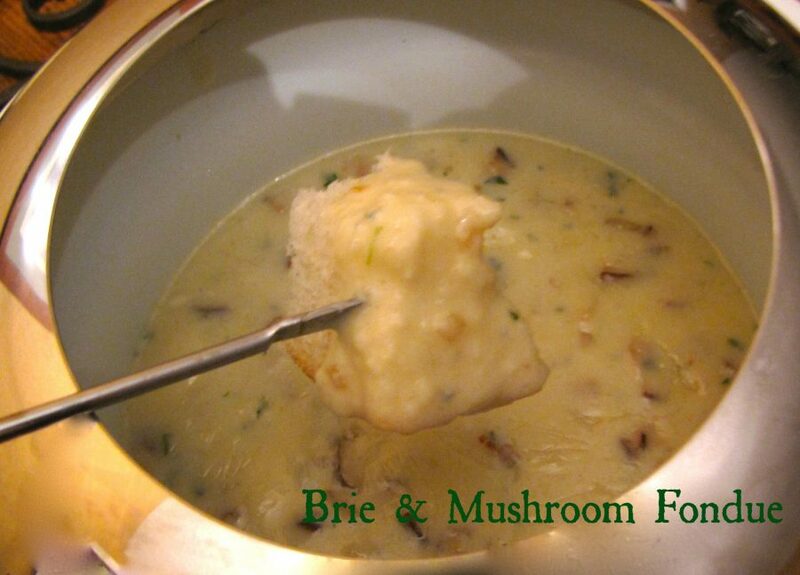 Perfect for weeknights, great for potlucks or tailgate parties, and really, really good leftover. I have a couple of kinds of Asian noodles that I can easily find in my regular grocery store. You can either get rice noodles (on the left) or bean thread noodles (on the right). Both are naturally gluten free. Yay! The thickness of the noodle is up to you but I prefer a slightly thicker noodle similar in size to spaghetti or linguini. 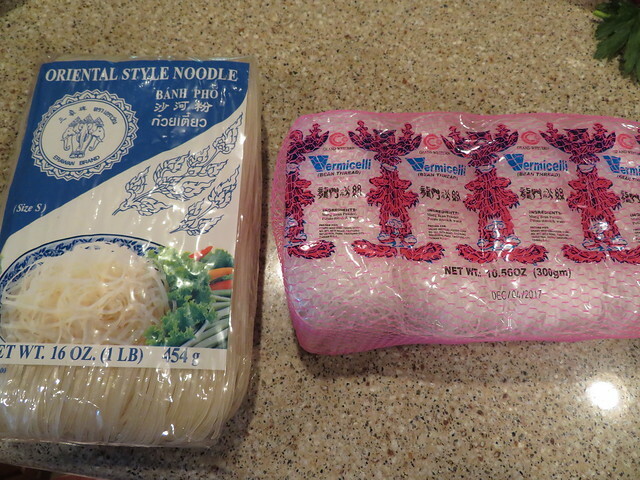 The pink packaged “vermicelli” noodles on the right were suggested in the original recipe but are a little too thin for my taste and tend to clump all together in the bowl. However, not to fear, they’re perfect for my favorite Spring Rolls so I’ll have no problem using them up. 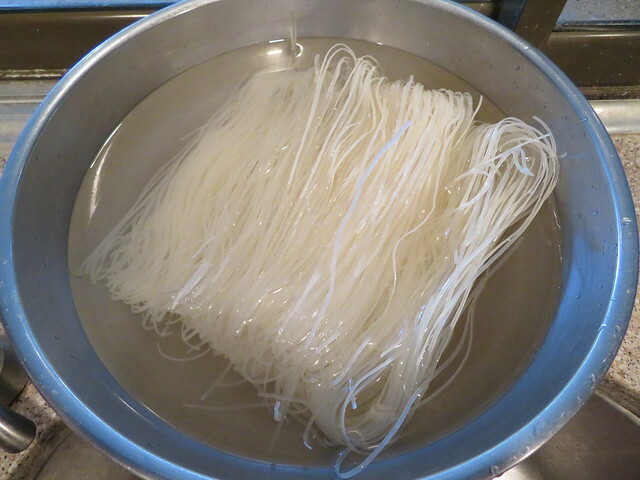 If you have the bean thread noodles, they are sometimes also called Glass Noodles because they will be almost transparent when you cook them whereas the rice noodles remain more whitish in color. Both are good for this recipe. If you have an Asian market, look around and you’ll find many, many varieties to try. Just like pasta, you can easily swap out noodle sizes and shapes in this salad so don’t worry if your store doesn’t have exactly the same thing. Even though these noodles cook very quickly, it’s a good idea to give them a pre-soak in a little warm water. I have 8 ounces of rice noodles just hanging out in a bowl of water while I chop all the veggies. Speaking of chopping…remove the seeds from 1 jalapeño or thai chili and chop into a very fine dice. 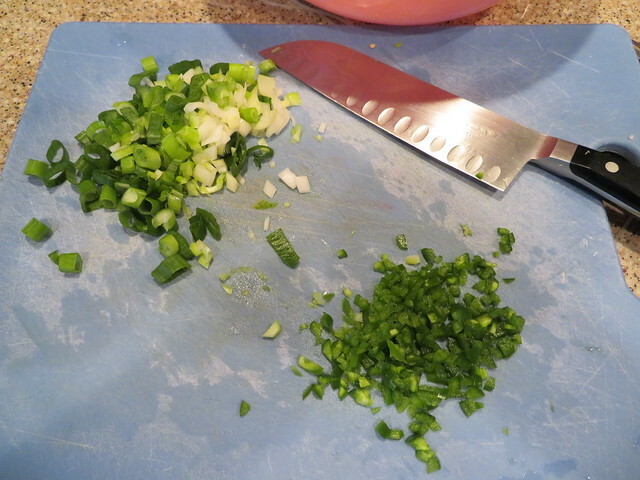 Finely chop 2 green onions and 1-2 ribs of celery while you’re at it. 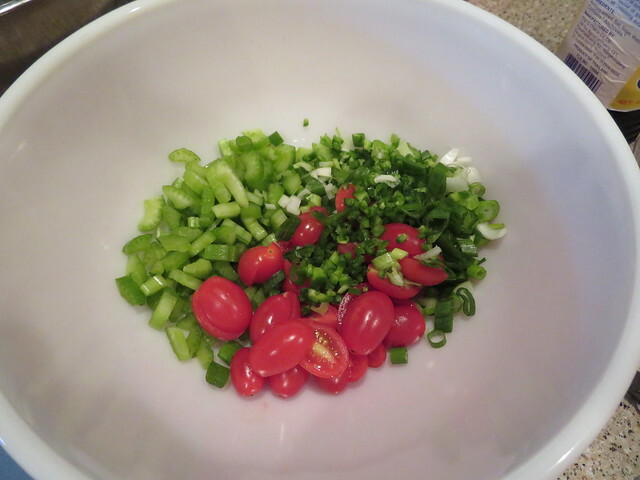 Place the veggies in a large bowl and add 1 cup of cherry tomatoes that have been cut in half. By the way, feel free to use more or less of any of these veggies as you like. I ended up adding more tomatoes because they were ripe and ready to go. I made several additions to this recipe including 1 cup of shredded carrots and lots of fresh herbs. 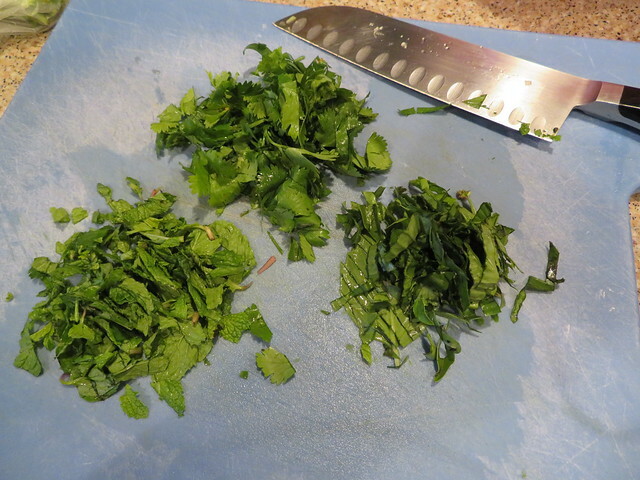 I have about ¼ cup each chopped fresh mint, cilantro, and basil. I like to keep the herbs separate from the veggies and wait to add them until the very end so they don’t wilt. 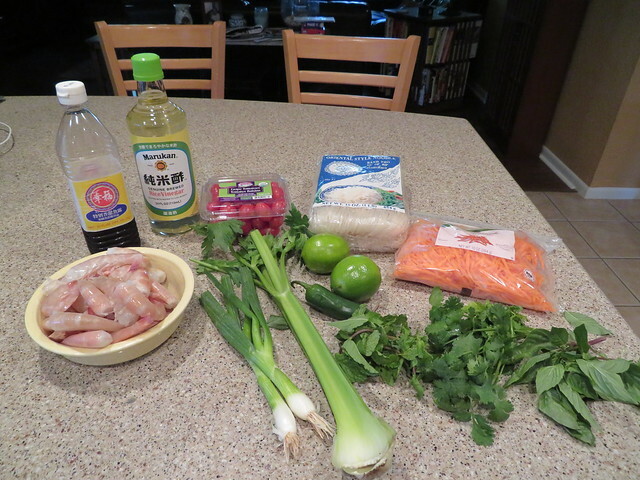 The dressing for Asian Noodle Salad with Shrimp is something of a lesson in less is more. While I was making it I kept thinking, “There has to be something I’m forgetting…something I should add” but I’m glad I didn’t. This dressing is light but still flavorful. Instead of covering up the other flavors of the salad, it lets each one shine through. 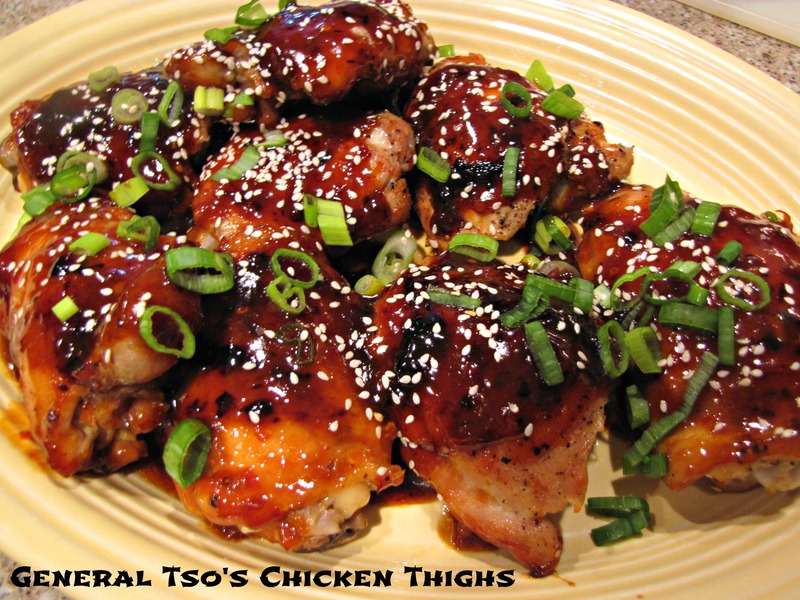 In a small bowl combine 2 Tablespoons fish sauce with 2½ Tablespoons lime juice. Fresh squeezed is always best. Limes not fish. 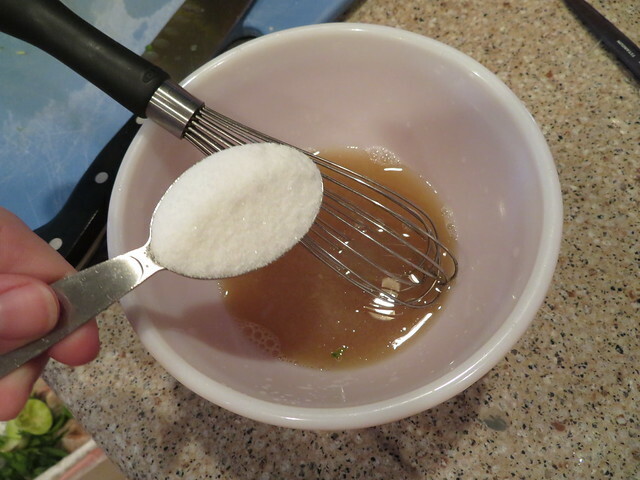 Add 2 teaspoons of sugar and whisk to combine and dissolve the sugar. That’s it! 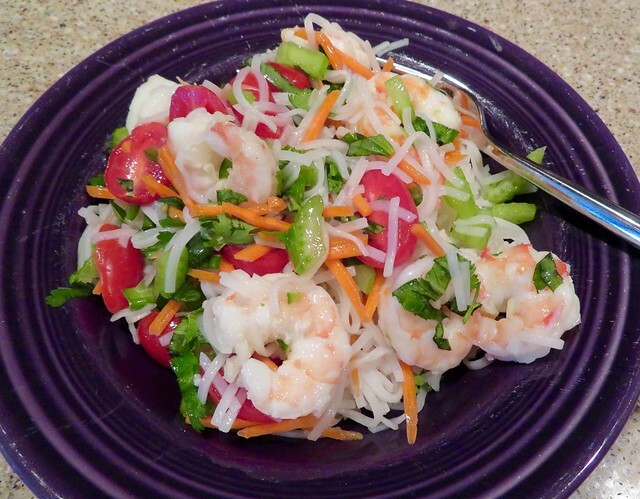 If you’re not a shrimp eater or are vegetarian, you can certainly make this salad without the shrimp. Substitute your favorite protein or go all veggie. However, since we LOVE shrimp and have them freshly and in abundance here, I’m always happy to have new shrimp recipes. Peel and devein 1 pound of large shrimp. 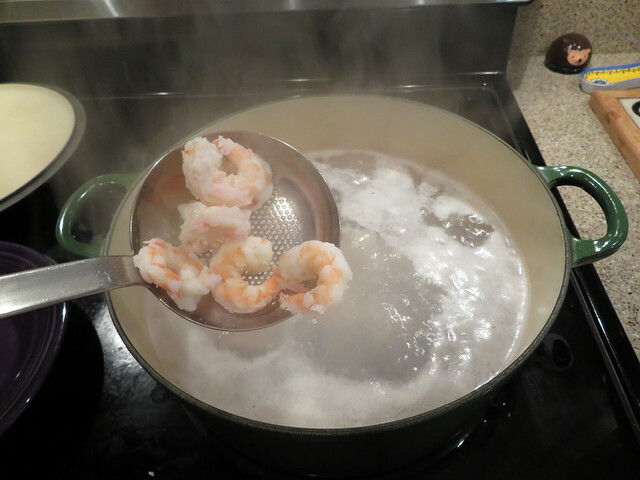 Bring a large pot of water to a boil and add the shrimp. Don’t walk away! These only need about 2 minutes to cook. Since we are cooking these without their shells, they cook incredibly quickly. Scoop out the shrimp when they are a vibrant pink and their edges have just started to curl. Save the shrimpy water for cooking the noodles. 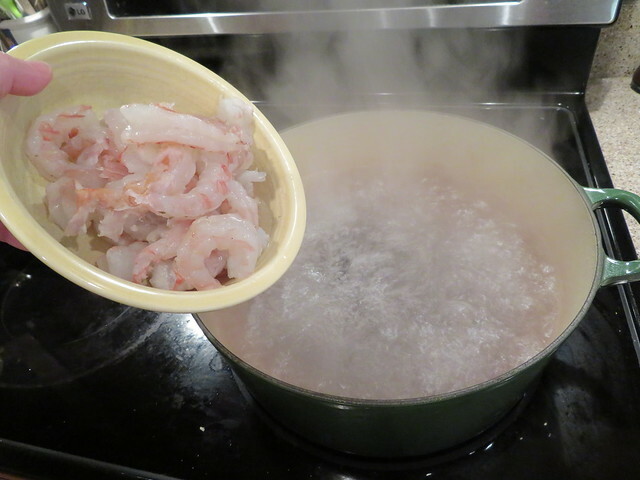 Note: If you want to save time or have shrimp peeling issues, feel free to buy pre-cooked shrimp at the store. You’ll spend a little more but sometimes that’s a good option to have. 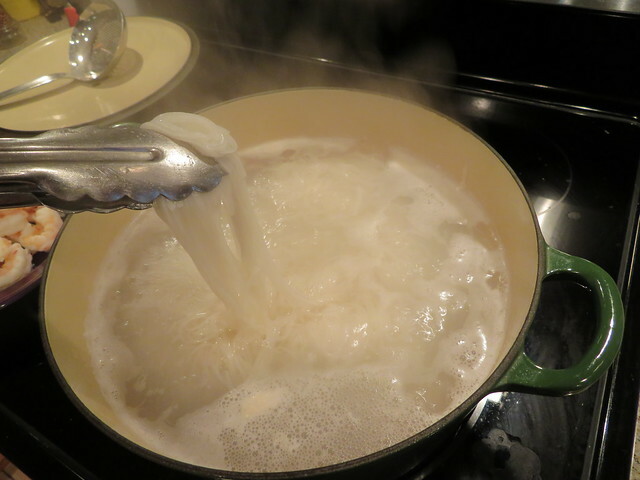 Drain the soaking water off your 8 ounces of noodles and add them to the pot of boiling water. 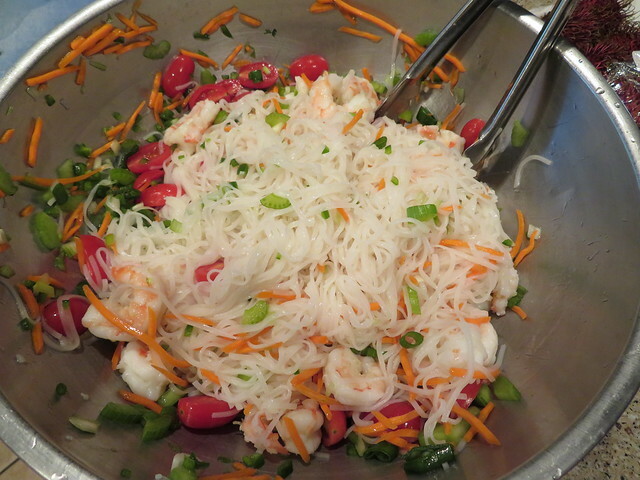 Like the shrimp, these noodles cook very quickly too…only about 3-4 minutes depending on their thickness. Keep an eye on them, lifting them out of the pot a bit to see if they are nice and tender. There’s really no al dente with rice or glass noodles, they go from stiff to done very quickly. Drain the noodles in a colander. If they seem super clumpy and sticky you can rinse them with a little cool water and shake out the excess. My noodles were fine as is so I drained them and added them to the bowl of veggies. 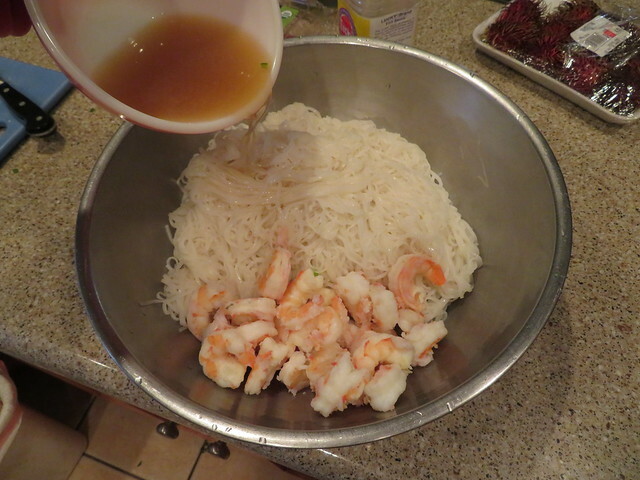 Add the cooked shrimp and them pour the dressing all over the noodles. The dressing will soak into the noodles and then down into the bottom of the bowl where you can toss it with all of the veggies. Once your noodles have cooled a bit, add the fresh chopped herbs and toss again to coat everything in the dressing. Let this sit for at least 15 minutes so all of the flavors can collaborate in the bowl. As I mentioned before, you can serve this salad as is at room temp or refrigerate it and serve it cold. When you dish it up, it’s easiest to dish out all the servings of noodles first then go back and give everyone veggies and shrimp. If there’s any extra dressing in the bottom of the bowl, pour a little over each serving. With my heartier sized noodles, 8 ounces of noodles made 4 good portions. IF you are in the midst of making this and it looks like you have way too many noodles or too few noodles, you can easily put some aside for another salad or quickly cook a few more. I know that’s not the most scientific approach to a recipe but you should know that rice and glass noodles sometimes expand hugely when they are cooked and sometimes act just like regular pasta. Just don’t panic over your noodles. 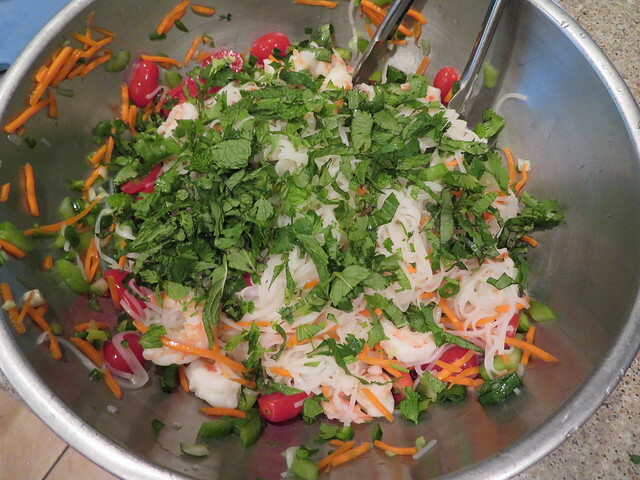 My friend Jen first made Asian Noodle Salad with Shrimp for me this summer and it has been a staple for us ever since. It’s GREAT when it’s so grossly hot outside that you don’t want to cook. Make this early in the day and it’s all ready to go when you get home for dinner. Add some quickly steamed (microwaved) edamame in their shells and some herb tea or a nice cold glass of white wine and summer dinner is good to go! 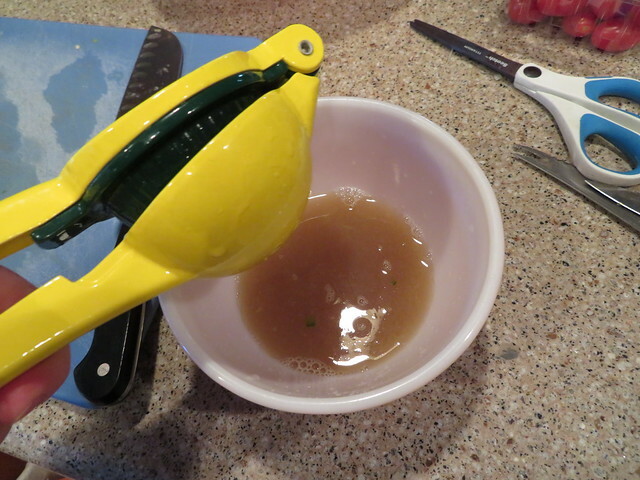 A vegetarian will have issues with the fish sauce–but that dressing DOES sound wonderful. I have fish in green curry sauce going as I write this. Yum! Beautiful! Great job! 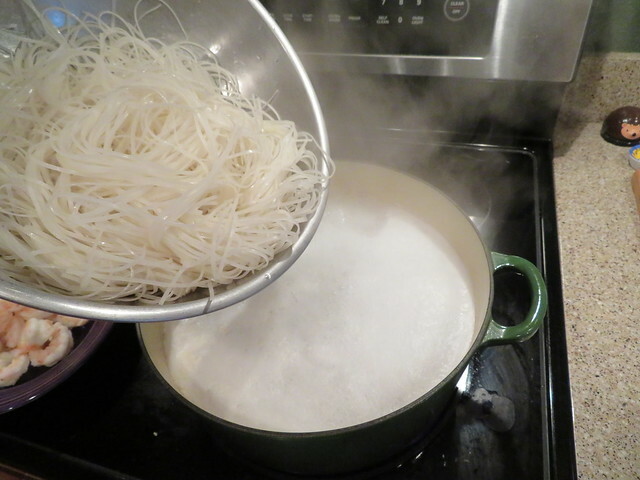 I generally skip the boiling step by pouring boiling water over the (thicker-style) noodles to soak them. You can test whether they are sufficiently soaked by pinching through one with your fingernails. Thai basil is really good in this. Grated or spiralized daikon and/or jicama are nice additions or can be subbed for the celery and tomatoes. If you microwave shelled edamame, you can through those in and skip the shrimp for a vegetarian option. We also like toasted almonds or peanuts in the salad and some peanut butter and/or tahini in the dressing. 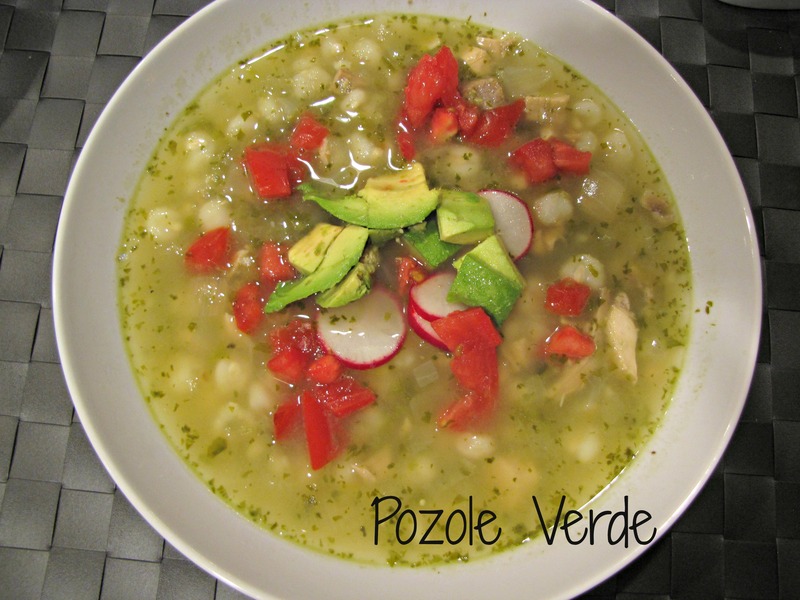 Roz, I have your recipe to try too. I really like the idea of the tahini and peanut butter in the dressing. So many options with these salads. And of course, the spiralizer makes everything more fun!